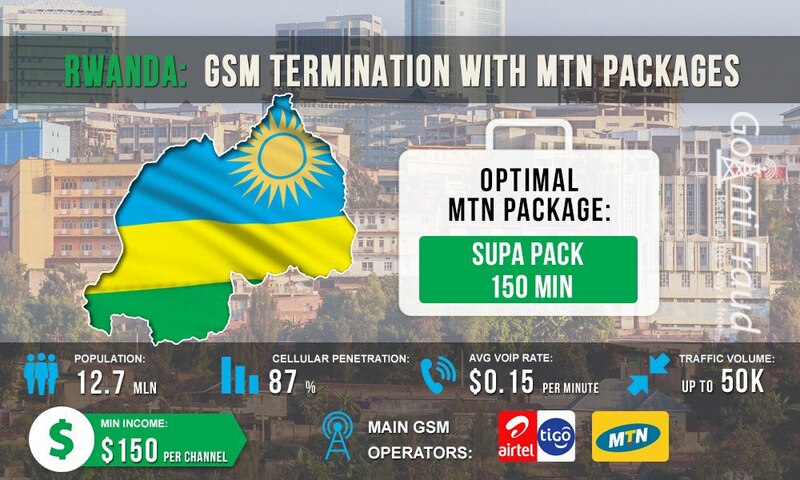 MTN has long been a monopolist in cellular services market in Rwanda. At the moment, the company is the second GSM operator in the country by the number of connections. It owns about 42% of all subscribers and has the best coverage in Rwanda - 95%. Once having chosen the most suitable prepaid package, you can successfully work in voice traffic termination business with MTN cards. MTN SIM cards are sold at operator’s shops and at the airport. The cost of one card is about 60 cents. To make money on the termination, we would advise finding another source of new SIM's on dedicated online forums, rather than buying at the operator’s shop, since in official outlets they request to present your ID for the a subscriber's number registration. Yolo 100 Extra. Provides 30 minutes for calls till the end of the day and costs 11 cents. Yolo 100. Provides 17 minutes for calls for 24 hours and costs 11 cents. Yolo 500. Provides 80 minutes for calls for 7 days and costs 57 cents. 30 min. The price is 40 cents. 40 min. The price is 57 cents. 80 min. The price is 80 cents. To use SIM cards and voip network hardware, choose the Supa Pack 150 min package. With this package, one minute of an outgoing call will cost $0.01. The terminator's profits can range from $400 per each GSM equipment port. In high-rate countries, antifraud systems usually work severer, so take care to effectively protect your cards from blocking by the operator.